Rich, smooth, and decadent homemade Nama Chocolate! Made with quality dark chocolate and fresh cream, this ROYCE’s copycat chocolate is truly a special treat. It’s one of the most popular gifts from Japan, but you can easily make it at home. If you are a frequent visitor to Japan, you probably have heard of or tasted this Japanese chocolate called Nama Chocolate (生チョコレート). You can’t really avoid it at the airport gift shops. They come in fancy packaging that makes them a popular gift item to bring home from Japan. Nama Chocolate is rich, smooth, and moist, with a silky texture that literally melts in your mouth. Good news is you don’t have to fly to Japan to enjoy the luxurious sweet. 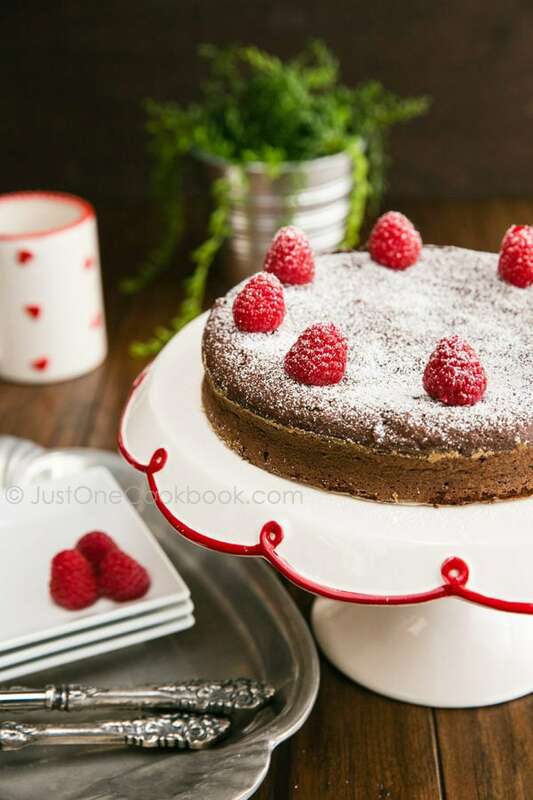 With this recipe, you can make your chocolate dream comes true today! Nama Chocolate is a form of ganache, similar to the filling inside French truffles. 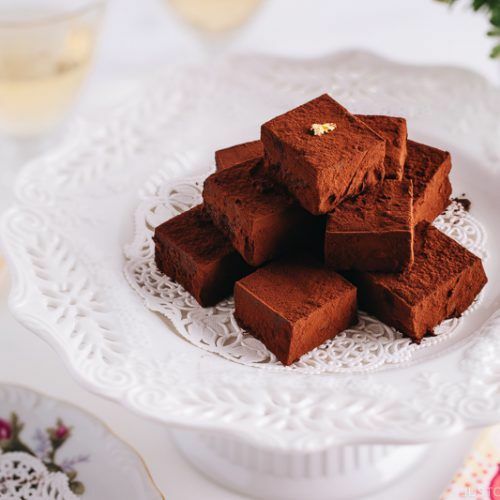 It’s made of fresh cream and chocolate, cut into little cubes, and dusted with fine cocoa powder. The chocolate can be called “Nama Chocolate” when it contains at least 40% chocolate and 10% cream by weight, and no more than 10% water. 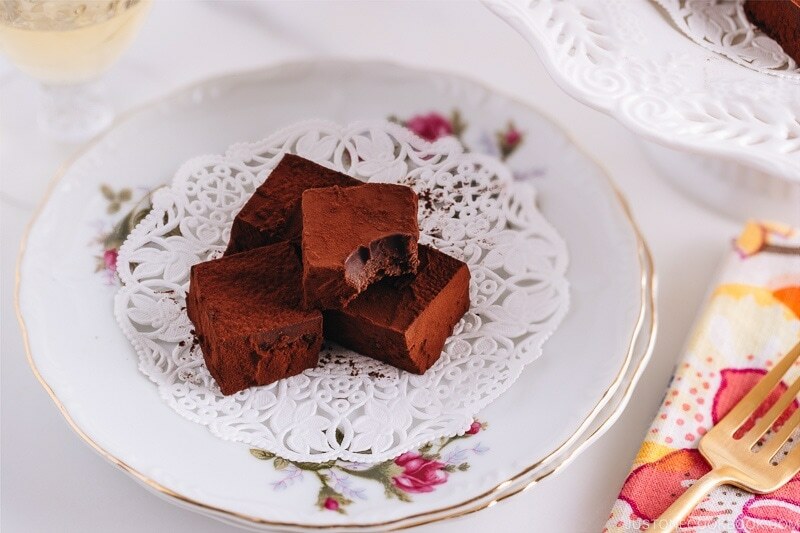 Nama Chocolate is much easier to prepare than truffles because the chocolate is poured into a square pan, chilled until firm, then cut into mini squares. No messy hands since there’s no rolling required. What Does Nama in “Nama Chocolate” Mean? 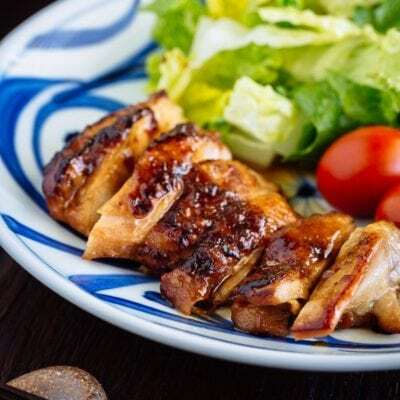 Nama (生, pronounce [na-ma]) means raw or fresh in Japanese. The name “Nama” Chocolate refers to the plentiful use of rich, fresh cream in the chocolate. Because of the fresh cream, Nama Chocolate must be kept in the refrigerator at all times and it is best enjoyed fresh, within 4 days after being made. You can also keep in the freezer for up to a month. If you’re planning to give Nama Chocolate as a gift, make sure to let the gift receiver know to consume soon. In 1988, the owner and chef Masakazu Kobayashi at the sweet shop Sils Maria created a new type of chocolate, and he named this chocolate Nama Chocolate and Nama Choco (生チョコ) for short. In 1993, Meiji, a snack company, released a chocolate product called Meltykiss (メルティーキッス) which was produced and supervised by chef Kobayashi. 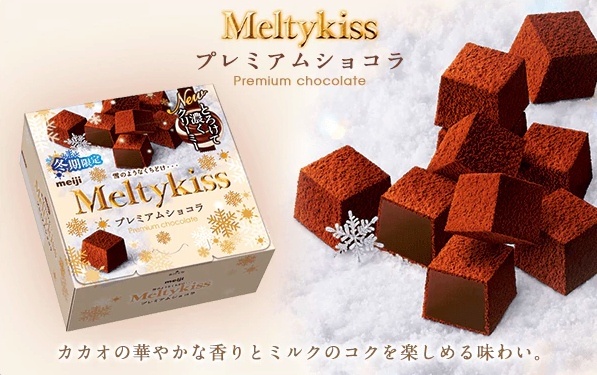 You can purchase a box of Meltykiss at Asian supermarkets, convenience stores and train kiosks in Japan. This chocolate is known for its limited time offering during the winter months as the chocolate melts quickly during the rest of seasons. Since then, major confectionery manufacturers started to sell Nama Chocolate, and it became a huge trend all over the country. In 1996, Hokkaido-based ROYCE’ (ロイズ) released ROYCE’ Nama Chocolate. Many of you probably spotted this chocolate at the airports or gift shops at sightseeing spots in Japan. Due to their popularity, this Nama Chocolate is known to visitors who have been to Japan. 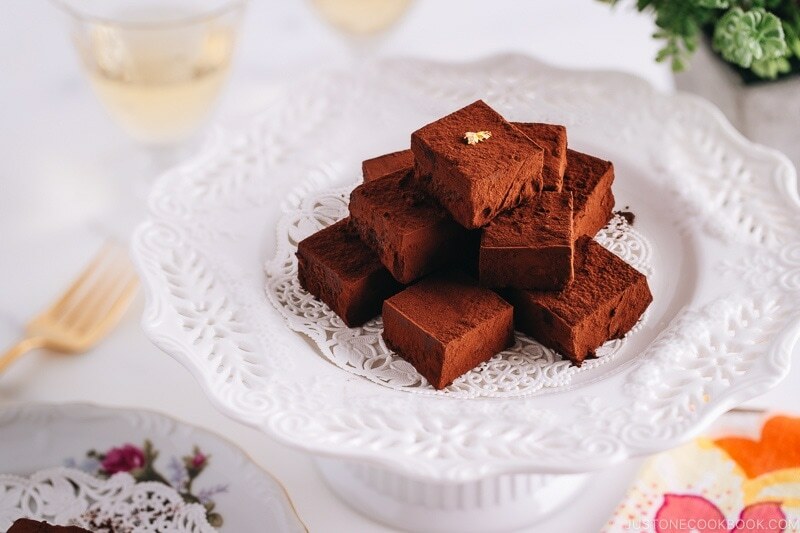 Although “Nama Chocolate” was invented in Japan in the late ’80s, this specific type of chocolate called “Pave de Geneva” was born in Geneva, Switzerland in 1930’s. 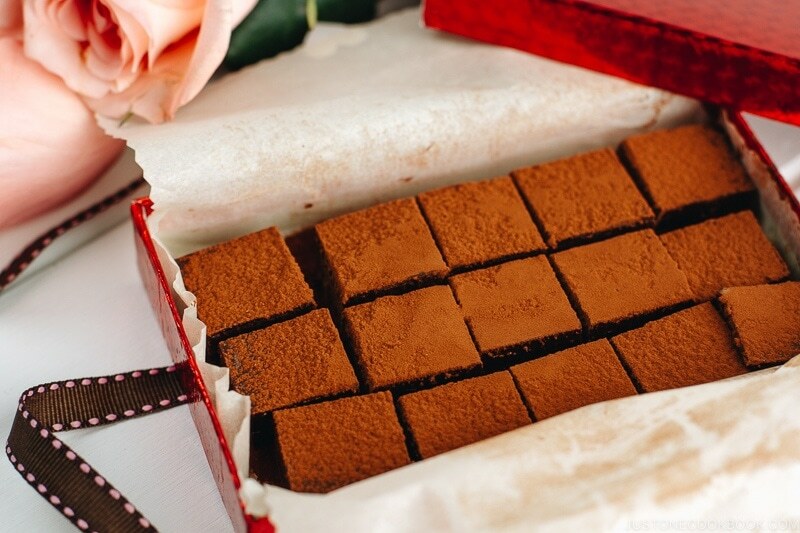 Pave de Geneva is made of chocolate and fresh cream, and cut into small cubes smeared with cocoa, just like Nama Chocolate. I’m not sure whether the Japanese chef had traveled to Geneva and knew of Pave de Geneva, or he figured out the Nama Chocolate formula on his own. Regardless, this is not an original Japanese product as it existed in Switzerland. If you’re a Genevan who tried both Pave de Geneva and Nama Chocolate, please share your thoughts in the comment below. Are they similar or exactly the same? High-quality chocolate is mandatory since that’s the most important ingredient for making delicious Nama Chocolate. Make sure the chocolate is made of 100% cocoa butter and does not include vegetable fat in the ingredient list. American heavy cream or heavy whipping cream (they are the same thing) has 36%-38 fat content. The ratio of heavy (whipping) cream (gram/ml) and chocolate (gram) should be 1:2. For this recipe, please do not replace chocolate with white chocolate (which I used in Green Tea Chocolate). Make sure the bowls and utensils you are using are perfectly dry. Even a small amount of water/steam can “seize” the chocolate melting process. It can happen all of the sudden from a smooth bowl of liquid chocolate to a lumpy, grainy mass of chocolate. Here’s a Green Tea Matcha version! These chocolate goodies are perfect for special occasions or as a hostess gift during the holiday season. I hope you enjoy making this Nama Chocolate recipe! Rich, smooth, and decadent homemade Nama Chocolate! 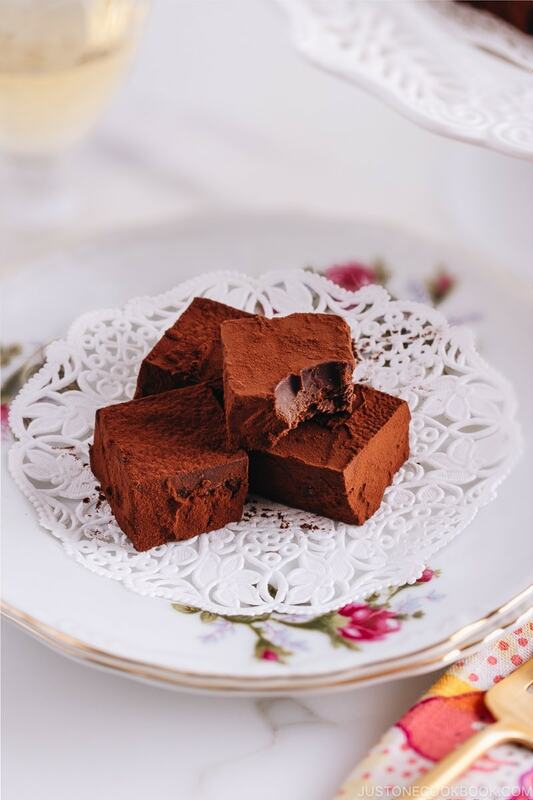 Made with chocolate and fresh cream, this ROYCE's copycat chocolate is truly a special treat. 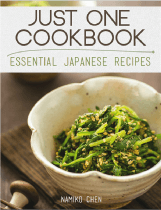 It's one of the most popular gifts from Japan, but you can easily make it at home. Line an 8" x 8" (20 x 20 cm baking dish with parchment paper. Choosing the right size tray is important for the height of chocolate (If you use a bigger tray, the chocolate will be flatter). Add the heavy cream into a small saucepan and bring it to ALMOST boil over medium heat. Whisk to evenly distribute heat and keep an eye on the cream. Add the chocolate into the heavy cream and stir to combine with a silicone spatula. Mix the chocolate and cream and make sure there is no lump. The chocolate should be completely smooth. If you like, add liqueur of your choice. Pour the mixture into the prepared baking dish and smooth the surface with the silicone spatula. Tap the baking dish onto the counter a few times (to make sure the chocolate is evenly distributed). Refrigerate until firm, about 4-5 hours. Remove the chocolate from the baking dish. Cut the excess chocolate around the edges to have nice sharp corners. Warm up the sharp knife with a hot towel, and cut the chocolate into 1” strips. Make sure to clean/warm the knife before each cut to achieve a nice sharp cut. Depending on your baking dish, the 4 sides of the chocolate may not look good (mine has curved edges and corners). If that's the case, save these chocolate pieces for yourself to enjoy. Then cut the strips into cubes. Remember to clean/warm up the knife before each cut. Sprinkle the cocoa powder on the top. Optionally, if you prefer all sides to have cocoa powder, you can dip in cocoa powder to coat all sides. 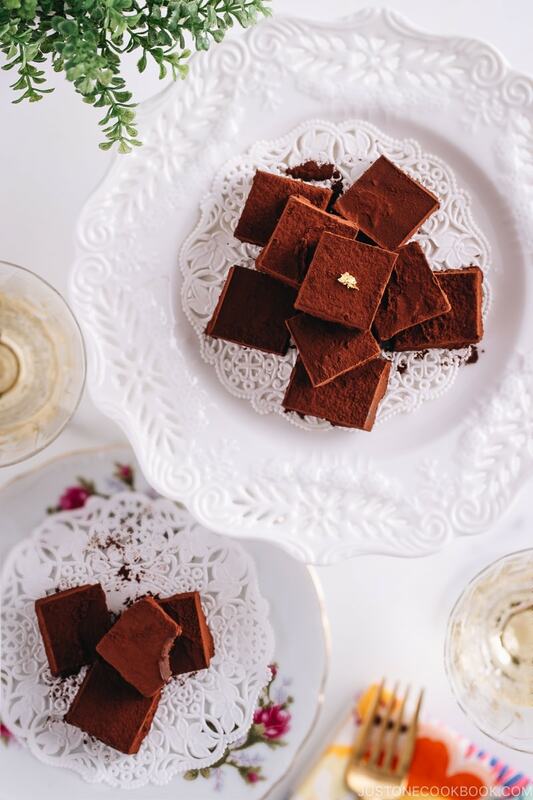 Serve Nama Chocolate on a plate, or put it in a box as a gift. If the chocolate just came out of the refrigerator, I recommend waiting for 5-10 minutes before serving so it's soft enough to melt in the mouth instead of chilled and hard chocolate. Keep in the airtight container and store in the refrigerator for up to 4 days. Or you can freeze the chocolate for up to a month. IMPORTANT: PLEASE READ BEFORE MAKING! Make sure the bowls and utensils you are using are perfectly dry. Even a small amount of water/steam can "seize" the chocolate melting process. The two most common problems of working with chocolate are separating and seizing. 1) Separation (oil came out of the chocolate) happens when you get the chocolate too hot. Dark chocolate should never be heated above 120 degrees F (Milk chocolate and white chocolate should never be heated above 110 degrees F). When chocolate gets too hot, the cocoa butter separates from the solids, and there is no way to salvage it (although you can bake with it and it tastes fine). The best way to prevent separation is to use gentle heat (simmer on lowest heat) and stir frequently. Since we're not using a double boiler in this recipe, make sure you do not bring the heavy whipping cream to a full boil. Remove from heat as soon as you saw bubbles around the edges of the saucepan. 2) Seizing happens when moisture is introduced to melted chocolate (even a tiny amount of liquid or steam). It happens all the sudden from a smooth bowl of liquid chocolate to a lumpy, grainy mass of chocolate. To learn more details and how to fix the overheated or seized chocolate, please read HERE. Editor’s Note: The post was originally published on February 6, 2012. The content has been updated. Looks great. I never realised Japan had its own version of truffles. That is so so pretty! Love the pink box and the gorgeous chocolate inside! I love your presentation of these nama chocolate! So tempting and beautiful. I’m a sucker for all kinds of chocolate. I love how easy it is that your recipe doesn’t involve “rolling” (that could get real messy). 🙂 What a wonderful Valentine’s Day gift idea. Lovely and delightful post!! I have never thought of making chocolate in my own kitchen. This looks so easy beyond belief to make. I would give a try someday. Thanks. Oh I cannot think of anything I would rather be eating right now than this nama chocolate. Your photos are lovely! I don’t know why you don’t make more desserts because you really do them so well! 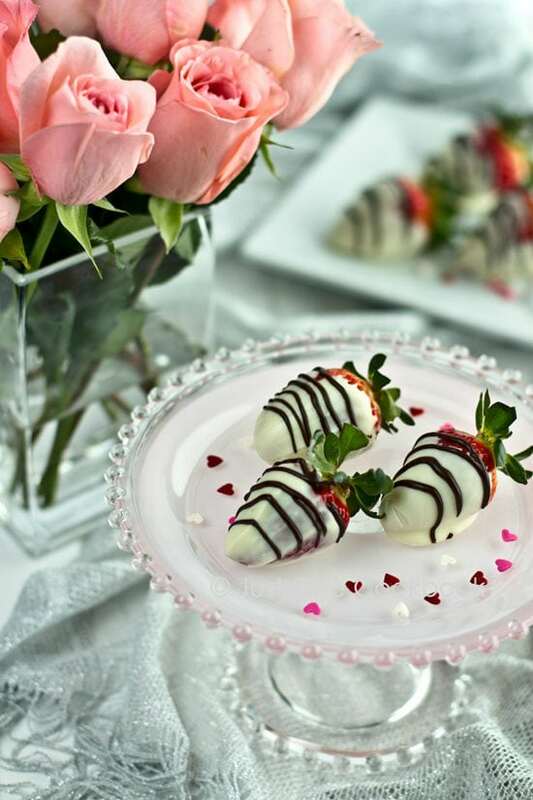 These are really pretty and homemade chocolates are perfect for Valentine’s Day! wow homemade ROYCE?!?!! i didnt know you could make it. They look exactly like ROYCE! 🙂 I used to get them from the nrt airport when i visited tokyo – i rem they had to be refrigerated all the time! Wow. Wow. WOW! These look sinfully perfect! You must know how I approve of your foray into the world of desserts! These chocolates look marvelous…and my family would be thrilled if I made these beauties! Have a great week, Nami! How I wish I lived next to ur house so I can get one of them before the box go to ur brother in law! Haha ha! These are so pretty Nami! You know how excited I get when I see desserts on your site. I could see these on one of my dessert tables. Gorgeous!!! 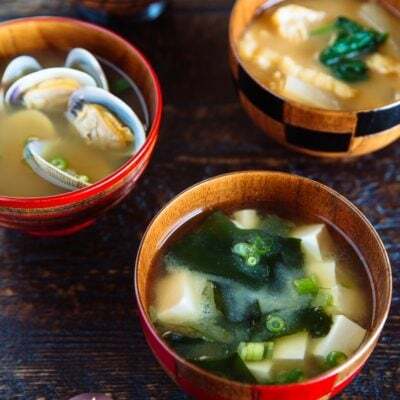 Nami, what an incredible recipe, perfect for Valentines Day and every other day of the year! I’ve tried ROYCE chocolates in Singapore before and it’s delicious! I love how smooth it is and it’s real popular in Singapore. I didn’t realise that it’s so easy to make though. They also had this chocolate covered potato chips which sounds a little odd but they actually went quite well together! Lovely photos as always! These looks so beautiful and delicious! Cannot wait to make these. Lovely chocolate and look tempting , nice presentation too. I love having an excuse to eat up fresh goodies like this in a couple of days! They look delicious. Great to hear of Nama – beautifully romantic. I have never herd about this delicacy, thank you for sharing it with all of us. the parcels are so pretty , i like it! An ideal gift for Valentine’s Day…but really good anytime because chocolate is just so yummy! Now I can make my own Japanese truffles! This is divine and How lovely to make your own. I feel like running to the kitchen and make some. How beautiful! And they are easy as well! Love them! Hi Nami! I can just imagine how creamy this chocolate must taste, too bad my skin would get horrible breakouts if I eat even a little bit of chocolate, so this recipe can only be appreciate by afar… Hope you have a great week, it’s pretty cold at Houston so I am thinking stews for dinner would be good! Lovely chocolate bites Nami! Have a nice week! I like these chocolates! And they’re easier to make then truffles (’cause they’re cut with a knife, instead of rolled into balls)! What an amazing treat for Valentine’s Day. My mouth is watering, Nami. LOVE this! Never heard of this kind of chocolate treat, very similar to ganache indeed. The squares look wonderful, love chocolate that melts in my mouth. Thanks again for the recipe and i'm sure you're brother in law is enjoying the truffles! Nami, the chocolates look extraordinary! Especially with your lovely presentation. I wish I had such a box now. I would finish them instantly. Instead of the dinner. You are totally right: they are like a simplified version of black chocolate truffles 🙂 I must try making them one day. Thank you for your kind mention and link! WOW! WOW! WOW! Not many more words to describe this than WOW! You are so amazing woman! Yummy! I’ve never had Japanese truffles before but I’m so willing to try 😀 This looks so yummy! Thank you so much for sharing such a delicious looking treat! Oooh these look just like melty blends! Awesome job Nami! 2012 is the year of sweets for you. I’ve never heard of this, but it looks awesome! I love that the base is dark chocolate–the only chocolate I’ll eat as candy. Even though I’m not a big fan of chocolate, these ones look so exquisite and best of all they are homemade too! They rival those very expensive ones that I have seen at specialist chocolate shops. These look amazing, Nami! They look exactly like store-bought ones! haha. Gosh! Nami u you have again caught our heart on this quick and easy Nama Chocolate!!! Looking at it now makes me craving for some… i think i can eat 5 or more in one go :p And your photos look awesome!!!! They look so lovely in the box. Good as a valentine’s day gift. This looks amazing! I love anything chocolate; I didn’t realize Japan had much chocolate. If I wasn’t trying to eat healthier, I would be making this tomorrow! Wowsers! Very impressive. I’m hooked on Ghiradeli so this recipe definitely has my attention! So when should I visit your house for a pick up for these chocolates ? I have never had this type of chocolate, but it looks so rich and delicious! I would love to get a box of these for V-Day! I have no doubt your brother in law is enjoying your silky, gorgeous Japanese chocolates Nami…(what a perfect gift!) 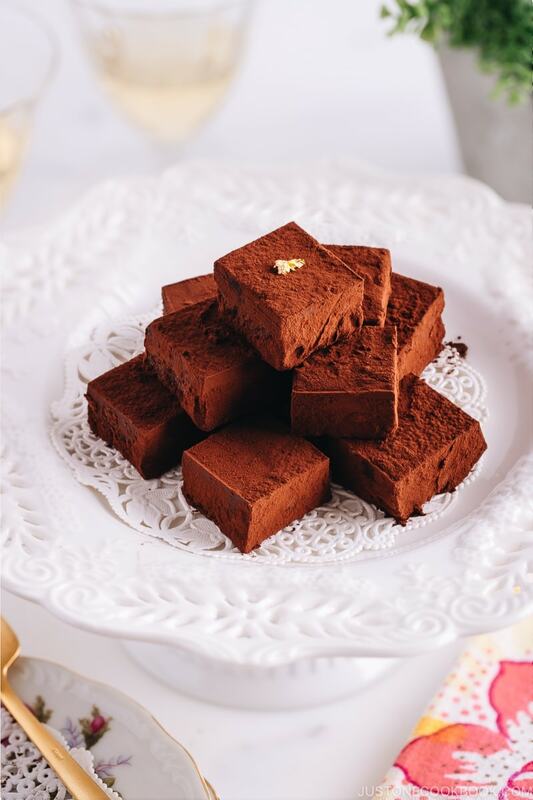 – they look beautiful and the dusting of cocoa is the perfect finish. Happy Valentine’s Nami :). mmmm… chocolates! You’re really amazing to think of all this recipes and love your presentation. You’re driving me crazy with this chocolate! Rather than make it myself, can I just order a batch or two? Seriously, I’ve never made chocolate but both Bobby and I love it so I can see this in our near future. Thanks so much for sharing this! I am so in love with Japanese chocolates. I love the creaminess and richness of these delicacies but I have never thought of making it myself. I can’t wait to try these out soon. Thanks for sharing! Thanks for another lovely recipe. May I know what size of the tray did you used? If you want to get bigger squares, use smaller containers (anything square works) so the height of chocolate will be taller. I was planning on making this chocolate for valentine’s day but one problem. The chocolate melts very easily and i was wondering whether it would get melted by the time i reached school. I can’t find 70% cocoa, can i use some other chocolate? What! You make fancy chocolate too? That is a most beautiful gift! I sure would love a box of those… ^_^ You’re too sweet! Hi Nami – I just adore ROYCE chocolate – I think it’s made in Hokkaido, right? (I’d love to visit Hokkaido… but anyway) – My ex girlfriend always used to bring me some boxes when she came to visit – I’ve been trying to get my friend who lives in Japan now to send me some but he says he can never find it. In Tokyo apparently there are not so many places where you can get it – I think there’s a store at Shinjuku train station… maybe? Impressive you are making your own chocolates. A great Valentine’s Day treat/gift! Those look so divine. I’d love to taste Japanese chocolates. These would be perfect for valentines day! Your pictures are stunning Nami! I love this no bake dessert! I can imagine that it does melts in the mouth. 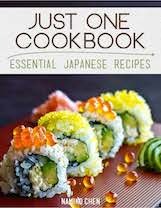 Beautiful photos and great recipe too..I will try making it! Thank you for sharing dear friend and have a great day!!!! Ready to try this recipe!!! This is indeed “fresh” and beautifully simple – the chocolate is the star as it should be. These gorgeous homemade chocolate make beautiful valentine gifts. perfect! This a perfect for Valentine’s…beautifully done Nami. Oh! I live near LA…if you have a chance to be in the area, please let me know and we sure should meet. Your Nama chocolates look beautiful and rich. What a special gift indeed. I’m thinking that you have a very lucky brother in law! Oh my. This is such a sweet recipe! Perfect for V-day! I LOVE chocolate and I can’t even recall why I haven’t made my own homemade chocolate before. Since you posted this recipe (which I am so happy you did), I will definitely be trying it this weekend. Oh my gosh, how talented are you! That looks fantastic Nami! A good idea to make. Thank you for sharing the recipe. That looks SO good!!!! It’s like…Meiji chocolate truffles, right? That looks super yum. Did you line the pan with parchment paper, is that’s what’s shown in the one picture? 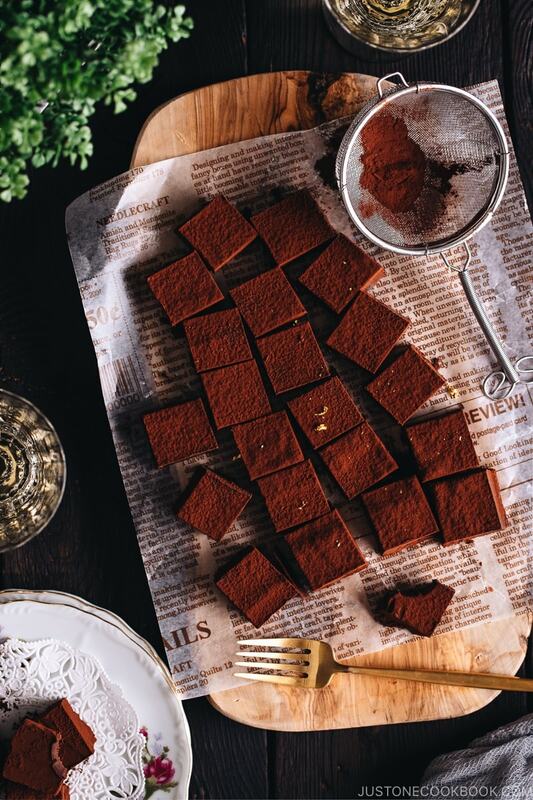 Nami-your chocolate squares remind me of truffles, but made in a sheet pan. Love the recipe, and the gorgeous photos! Hi Nami, thanks for sharing this wonderful delicious chocolate. Looks extremely good and tempting. Love your presentation. Have a nice day. Nami, I’m so glad you shared this recipe! I’ve had these Japanese chocolate before – they really just melt in your mouth. So delicious! And I’m surprised to find out that they are not that difficult to make. And next time I’m in a Japanese grocery store, I should look for the Joyce brand as well. divine recipe, Nami! and such charming photos. I’m not one for making sweet things – but I know what to ask for next time my husband goes to Japan, that’s for sure! Oh yes! I know Royce’s chocolates very well! I’m so glad you shared this post- It’s a winner and great for any occasion for presents! Perfect for Valentine’s Day! This chocolate must not be too sweet as no sugar is used. Very easy to make too. Will have to give it a try one of these days. Hi Nami – I fell in love with Nama chocolate the first time I tasted it! 🙂 Thanks for this great recipe, I’m definitely going to make it! 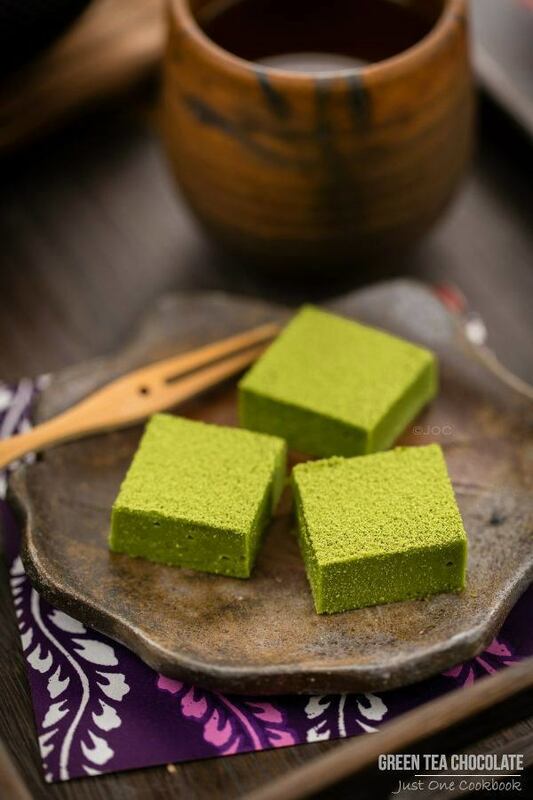 How would you make a maccha version? Hi Nami! I love the simplicity and elegance of this dessert. I would love to grab a piece and just devour it! Beautifully styled too! P.S. I think you should do more dessert posts :). This is so perfect for Valentine’s Day, or any day for that matter! Need chocolate now!!! Homemade chocolate nothing can beat that. And with few ingredients no messy rolling this recipe is gonna be on my cookbook. Thanks Nami. Why buy some when you can make it? These chocolates ARE perfect for valentines day coming up and they are not even difficult to make! Another great post, Nami 🙂 I love all your recipes, food styling and photography but I hope you keep posting more desserts! 😀 I will definitely try this. Thanks for sharing. These look absolutely perfect!! I love easy truffles like this and can’t wait to try. I haven’t heard of nama chocolate before, but now I must try them! Who knew the Japanese loved chocolate as much as we do? Reminds me of fudge! Stop cooking/baking right now and become a chocolatier! If only my mouth were my eyes! So delicious my mouth is already set at drool factor five! Have a good valentines Nami! Those are just gorgeous!! I personally love that you don’t have to roll them! These look delicious! I just love your photos. They make me want to reach in and take a bite! I really love this version of truffles, they look amazing! wow, this is so easy to do…I love to make this on Nami is it okay to use a tray with different shapes? These are awesome Nami 🙂 LOVE IT!! I didn’t realise (without sounding ignorant I hope) that Japanese had their own version of truffles – I know there are a lot of cute sweet snacks, etc but didn’t know rich chocolate truffles were one of them! Nami, what a great recipe! I can’t wait to try it. Perfect Valentine’s gift for my husband! This version sounds so simple N. I make one with milk powder butter and sugar. When overcooked, the chocolate doesn’t turn out well. Everytime I make them, I will be stressed he he 🙂 But now I am going to try your version. Simple and straightforward. Oh, I miss the chocolates from Royce. They never last in this house. What a wonderfully easy recipe. As I’m not much of a baker, I’m so glad your recipe has such simple ingredients. Definitely would like to give this a try as your pics are just too appetizing. Those chocolate bars look divine! 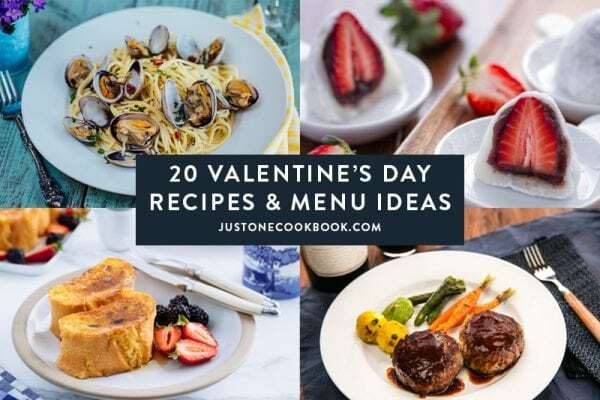 What a great recipe for Valentine’s Day! Also a great gift idea to give out. Hope you are having a wonderful day. I love how simple yours is. And the photos are stunning! You’ve come so far since I started reading you! Hi Nami…was wondering is the cocoa dusted over the top if the chocolate only or all over each slice? I’m SO impressed that you made your own chocolate! WOW! Made these yesterday and relished them! I couldn’t believe how easy it was. Since I made these for my lil one, i simply avoided adding any liqueur and it was pleasure to watch him enjoy homemade chocolate 🙂 surprisingly for a 20 month old, he rather likes bitter chocolates! Thanks, Nami for posting a winning recipe! Hi Sia! Thank you for trying this recipe. I’m really happy your little boy even liked this! 😀 Yay! Hi there! I was just wondering if you could tell me what the fat percentage of the heavy cream is? I can’t find it over here (i guess they just don’t call it heavy cream) but i figure if something has a similar fat content it should be ok? oh what a shame! but thanks! ^_^ I’ll make them this weekend! Thank you for the great recipe, it taste exactly how I remember Royce to be. Can’t thank you enough!! hello, i LOVE Royce nama chocolate but it is kinda pricey in the Philippines so I would really like to try this recipe. I have no knowledge about alcohol so can you recommend good liqueur? and how much should i add? thank you so much. Hi girlie! I also don’t put alcohol but I know people put Grand Marnier or Cointreau. You can start with 2 Tbsp, and add more if you like. Thank you for your compliment! Hi, Nami I have been missing for a while trying to catch up on things Iv’e missed this looks so good and your explanation of the word (Nama) only adds to my chocolate vocabulary. The + side as well is I can experiment with the alcohol element. I am so glad to learn that Nama Chocolate can be made. I thought that’s the range of chocolate under Royce brand. Tasted it once when my friend brought it back from Japan. Yah, he got it at Narita Airport. We can get it locally in Isetan but it costs more than double the price paid in Japan. Now I can make my own Nama Chocolate in my kitchen!!! Yabedabedoooooooo! My birthday is just around the corner. Probably will made it as a treat for myself and as an offering to the monks in our temple on my birthday. Thanks for posting this! I love ROYCE’ Chocolate. I used to buy it when I was still in the Philippines. Unfortunately there’s none here in the US. So thanks for posting, I will try this soon! Did you line with parchment paper? If so just lift it up and peel from side – it should come off quickly. is it the paper we use to bake cake?i was using that paper, is hard to release, sticky and i need to cut it off especially the bottom part and waste part of it.anyway i would like to thank you for providing such good recipe, can be say is 90 per cent similar to royce name chocolates, i love it so much, thanks again Nami. Thanks for your feedback – I really appreciate it! Yes, so you used the parchment paper but stick to the bottom part. I try to think what could cause it, but I’m not sure. Maybe fat content inside the chocolate? I don’t make dessert enough that I’m not experience enough to come up with any possible reasons. I’m very sorry I’m not very helpful here. Hi Nami, I made some nama chocolate with a recipe similar to yours last week, but it is very hard and not soft. Need help, do you have any solution to save my precious chocolate? Hi Nami! Came to this post from Mel’s blog and I’m going to make this for Xmas! Thanks for sharing! Hi Esther! I’m terribly sorry for not getting back to you sooner. I assume you already made it this past weekend. >w<.. Uhm.. me and my friend saw this recipe and decided this was the recipe we are going to use to make Valentine Chocolates. I was just wondering how long can the chocolates last not in a refrigerator/cooler since Valentine's Day will be on a school day? Hello Nami. I am doing an article for valentines in a independent illustration zine and found this recipe which is wonderful. Would I have your permission to include this in my article if I make sure you are credited on the page? Hey Nami! this recipe looks wonderful! & i’m planning to use your recipe to make it for Valentine’s Day. However, i was wondering if I could use silicon molds (http://image.made-in-china.com/2f0j00DvjaLPYWnFqO/Silicone-Chocolate-Mould-Candy-Mold.jpg) instead of an 8″ square baking tin? I happen to live in Singapore, and I’m afraid it would melt by the time I reach school. Is there any other solution other than using a cool pack to keep them not melted? Also, is it possible to use either cocoa butter or powdered sugar to make the chocolate sweeter? So sorry for the many queries! Well, cool pack or ice or anything to keep it cold is necessary. As long as you can keep it cool ALL THE TIME like refrigerator temperature, it should be fine. If you could use milk chocolate instead of semisweet if you don’t like the bitter taste of chocolate. I personally prefer more cocoa in it, but milk chocolate will be more mild and you don’t really need to add sugar in it. But of course feel free to adapt to your liking. 🙂 Hope this helps! thanks so much for your help, Nami! since that i’m using silicone molds, do i need to grease it before pouring in the mixture? Hi Christel! I did a little bit research for silicone mold method. It looks like the best way is to apply thick coating of tempered chocolate on the mold first (you need additional chocolate for this). Put the mold in the refrigerator to let it cool. You make nama chocolate until step #4. Then let it cool down before you pour the chocolate into the molds. You only put 80% full. Drop the mold on the kitchen counter to make the surface flat and smooth. Keep in the fridge till the chocolate is firm. I haven’t tried this method on my own, so this is what I could advise from my online research. I hope it will work out! Good luck! thanks so much Nami! tempered chocolate is where i have to let the chocolate cool until a certain temperature and add cocoa butter right? really sorry, i researched on tempered chocolate before, and there were so many ways, i’m unsure of which method to use! Hope this helps. Please feel free to ask me. 🙂 I’ll answer the best I can. sadly, due to hot climate, the nama chocolate was still too soft even after refrigerating them for almost a day. i put them in a freezer instead for at least 8 hours, and it’s fine! as the nama chocolate was too soft, i wasn’t able to take it out from the silicon mold nicely, was they would break. Wow Singapore is really warm this season. I wish to be in such warm weather as it’s been so cold here. Thank you for your tip on freezing them. Sounds like that’s a necessary step if the chocolate melts so quickly! Must be hard to give chocolate gifts….and I assume stores won’t carry them at room temperature there. Hi Ceres93! I’m sorry it didn’t work out. I think I know the reason because I’ve done it before. I think some of your utensil or pot might have been wet, even small amount of water could cause this. I attach a link here just in case you are interested. Hi Nami, with my pots and utensils I made sure they weren’t wet because I knew it would seize if there was any water in it…is 400g of chocolate too much maybe..? Thank you for your response Ceres93! I always like my cream to chocolate ratio to be 1:2 for rich flavor and it works for me. My blogger friend just made Nama Chocolate using my recipe but she increased the cream and added butter and honey. thanks so much for this recipe. i want to try these. royce just came to nyc and i’m addicted. i’d love to make my own. Gratitude chocolates for my family! Just made them, and now I’m waiting for them to become stiff. I tried the “batter”, A-MAZ-ING! It is soooo good! I just really want to try the chocolate after it is completely done! I wanted to put a cherry or an almond in them before they became stiff, but I forgot to get some at the store…but I know they are going to be good either way! Thank you so much for sharing this recipe, I have been looking for this! A-MAZ-ING! Do you think I could use this recipe for a 7″ by 7″ square pan?? I bought a few boxes of royce chocolates from japan. Can i freeze them? Hi Grace! From what I found on Internet (I have never made enough that I need to store in freezer), you can freeze in the freezer up to 2-3 months. However, alcohol in the chocolate (if any) will be evaporated by then and the quality will not be as good as when it’s fresh. It’s also highly recommended to pack in air-tight container so your chocolate won’t absorb other food smell in the freezer. Hope this helps! I have a question.. Is this the same as Meiji’s MeltyKiss chocolates? My whole family are chocolate crazy, I would to make myself. May I know using van houten coco powder ? Or have to use coco in bar? hi Nami! I’ve just made a batch of this recipe and can’t wait to dig in!!! how long does yours usually take to firm up in the fridge? thanks so much! it was perfect after two hours, and i might try using a pizza cutter next time to avoid shards, think that might work? my son loved royce chocolates when we visited singapore so this is a very nice treat for him (if i don’t gobble it all down myself first)! Delicious, thanks Nami, I am a big fan of your blog, what a beautiful project. I will definitively try it with some premium peruvian dark chocolate!!! Saludos! Such an easy recipe and such a delight!! Thank you Nami!! 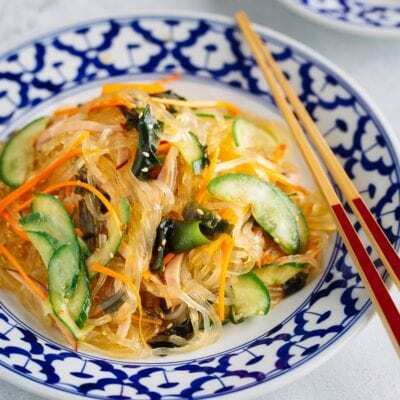 Hi Nami, I love how your recipes are fuss free and easy to follow. One quick question, how do you coat all sides on each piece of the cut nama chocolate without making a mess? I don’t want my mother screaming at me for the mess I’m making in her kitchen. Thanks! Hi Nic! Thank you! 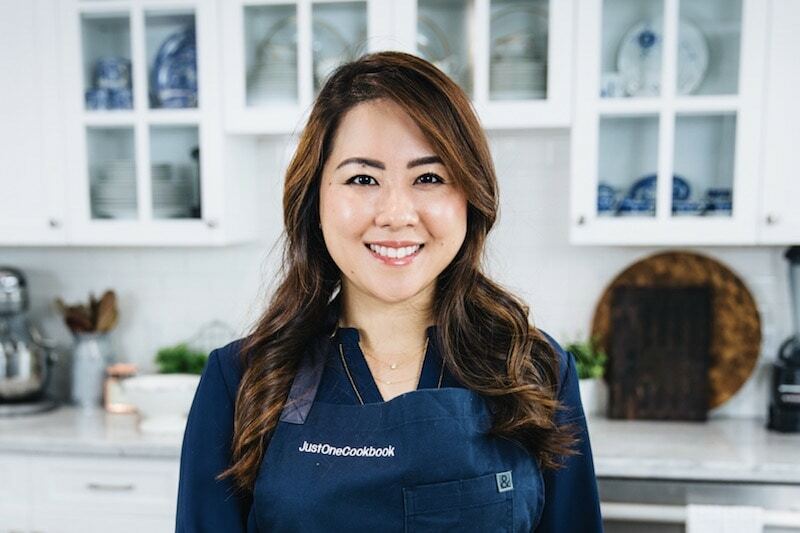 I’m so glad to hear you enjoy my recipes! Haha, I totally understand. After you cut nama chocolate into cubes, you can pick up each chocolate and dust cocoa all over it (using fine mesh sieve, I use one I use that’s for tea here – it’s small so mess area is only the area above chocolate.). If you want to do it nicely, you just need to focus a bit more and take time… for this picture, I made sure I don’t leave my finger print. 😉 Hope that helps, and hope you enjoy it! I love this chocolate, and I tried your recipe last weekend and got nice compliments from my friends. However I wonder have you ever tried to make matcha green tea nama chocolate? I love matcha, and if you can share your recipe to make that, it’s great! Thanks! Hi Amy! I’m glad you and your friends enjoyed Nama Chocolate! 🙂 Yes, you can add green tea powder to it. You need to use white chocolate and matcha powder. I haven’t tested the recipe, so it’s hard to say the exact measurement for each ingredients. I’ll add this to my list of requested recipes. Thank you! I MADE “NAMA CHOCOLATES! And they were sooooooooooooooooooooo good! 😀 I even made them from locally sourced products that I got from an Organic Farmer’s trade fair. I am very new to cooking (especially baking and desserts!) so I was so surprised these turned out so well ahaha ! Here’s a picture of a bunch I made. They look totally bad compared to your photos but they tasted so wonderful. Hi Aicha! Wow they look so delicious! So happy to hear they come out well and I would love to share your photo on Facebook fan page when I get a chance next time. Thank you for sharing the photo! The first time I had a sample of these in Japan, I was hooked! I am happy to try and make my own now…just in time for Christmas! I am making these today with Kahlua! I’m so excited! Then you have nothing to worry. 🙂 Enjoy! I’m a follower of your blog as i loved to try out Japanese cuisines. This nama chocolate looks tempting, and i wanted to try it out. I’m just an amateur and didn’t know much about ingredients. I’m from Malaysia. It would probably be hard for me to find fresh cream/heavy whipping cream specially in the area i’m currently living. May i know if i could substitute it with something else? Plus, i’m not sure how to differentiate between Heavy Cream and the normal whipping cream. Here, they didn’t really specify the fat percentage. So, all of them looks the same to me. May i ask your opinion then? 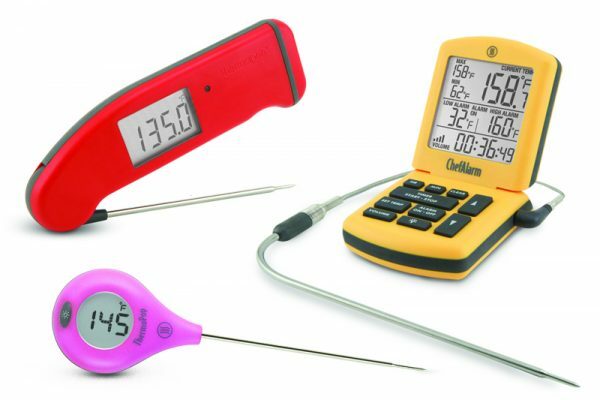 Which one would fit better to your recipe? I hope i could try it out! Thanks yea. According to this, the American “heavy whipping cream” or “heavy cream” is for cream that contains 36% or more milk fat. After looking at your links, I think http://www.fonterrafoodservices.net/en/sg/products/23/uhtcream/Pack is better choice. Don’t use Thickened Cream (read in “Australia” area – it says gelatine and other thickeners are added). Hello! When you heat the cream, what heat is it on? Medium or high? Also what does it mean by almost boiling? Is it when small bubbles form on the edges of the saucepan? thank you so much and hope u can reply asap for valentines day tomorrow!!! Hi Jenny! I updated the recipe with a little more info. Heat over medium heat. When you will see bubbles form around the edges of the saucepan, that’s when you turn off the heat. PLEASE tell me how to do it with white chocolate!!! All the chocolate used baking chocolate, couverture or those eating chocolates we find in chocolates snacks section? In this recipe doesn’t need butter? So how about the soft of the product? Can i use Lindt Excellence 85 or 99%? And if i want use 200g of chocolate, how ml of fresh cream should i use? Nope, no need. We put butter into white chocolate to make it smooth. Without it, the texture is not as good. 🙂 If you use 200 g of chocolate, then use 100 ml of heavy cream. 🙂 I think 85% sounds better. So with matcha nama chocolate 200g white chocolate + 1/2 of 125 ml whiping cream? 1 more thing is should you recommend some chocolate 85 or 99% brand? Wait, I’m a bit confused. 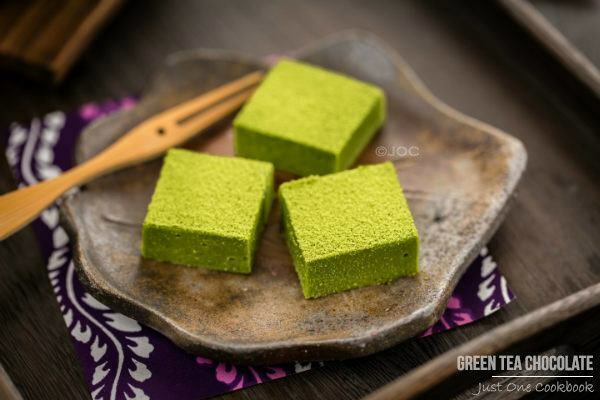 Are you making matcha (green tea) nama chocolate or regular nama chocolate? If you’re making matcha, please use white chocolate. If you are going to use half amount of chocolate, the rest of ingredients have to be half as well. TQ for a wonderful recipe. Tried but could not get the chocolate to stay firm even left in the freezer overnite. It was way too soft and ended up with lumps of chocolate. the taste was there. wondering was it becos I used whipping cream instead of heavy whipping cream? Hi Puilengc! What fat % was your heavy cream? I wonder if your chocolate got seized or separated. Could you read my Note section to see if you think this could be your case? TQ for the prompt reply. I made sure that I the cooking utensils were dry during the melting process and the result was a smooth texture chocolate. I cut with a knife dunked in hot water and wiping dry with kitchen towel. But the chocolate kept sticking to the knife and unable to lift from the parchment paper. The chocolate was soft and unlike the firm texture as shown in your green tea nama chocolate video. Hi Puilengc! Thank you for your response (and I apologize for my late response). The chocolate DOES stick to the knife even you heat up the knife and when you touch the chocolate, it easily melts. Which is why Nama Chocolate has to be ALWAYS kept in the fridge (and take out right before serving). I think your room temperature was also warm. Also make sure to work fast. 🙂 Your cream content sounds right. TQ for your reply. i live in a hot climate country. will it help if i dust cocoa powder b4 cutting? my frenz simply adore this chocoloate and i had been distributing y our recipe/recommending them to your blog. Puilengc, unfortunately matcha powder doesn’t prevent from melting, and the powder is so fine that it’ll be messy when you hold onto the chocolate. Do you have latex gloves? It can act as insulation from the heat, so I think it doesn’t melt as much as bare hand. If it’s melted tiny bit (mine does too, if I leave it out for some time), you can hide with matcha powder. But when it melts like butter, it’s not going to work. Hmmm maybe put it in the freezer (not to freeze, but to make it very cold) right before you cut? Hope you can figure out the best way to cut. Thank you for sharing this recipe. I’ve made this Nama chocolate for my son’s teachers day present. It taste nice but I’m not able to get as perfect cut like yours and further to that my chocolate seems like melting very fast. Do you suggest I put it in the freezer instead? I love nama chocolate so much and I desperately wanted to make my own. I even bought chocolate of different coca content to try to make it work. I used light whipping cream to subsitute fresh cream, which ended up giving me chocolate just taste the same as Royce’s except for the fact that it is too soft to be cut into pieces! Do I have to use fresh cream? It is unavaible in the market where I live and I was hoping you could give me a way to subsitute the fresh cream! Thank you so much! Love your work! Hi Huan! I believe heavy cream is necessary to achieve the good nama chocolate texture. The richness comes from the cream. And with ingredients that are very minimal, the outcome relies on good ingredients. Now about the softness. Do you live in a place with hot weather? That can be it too. Even where I live, which is relatively cool all the time, Nama chocoalte gets melted after I put it out for some time. It gets too soft to cut. Nama chocolate requires to be in the fridge all the time (besides a few minutes before eating), and if you live in a hot place… it’s really hard to cut into cubes. Thank you so much for following my blog and for your kind comment. I really hope you can make it work! Hi, Nami! 🙂 These are really awesome chocolates!! I made some just tonight and they had such an amazing flavor and consistency! I didn’t use cream because I’m vegan, but I found that canned, full-fat coconut milk worked quite well (you’d need to used the canned variety because it’s different than the variety that is normally used as a beverage). The coconut milk in the can separates at room temperature and part of it is solid and the other part is liquid. I didn’t heat it to mix them back together because I wasn’t sure if the ratio I needed for the chocolate would be the same. I just alternated between adding the solid coconut milk and the liquid (both from the same can) until the chocolate in the double boiler seemed like it had a good consistency. — I use a double boiler because then I don’t have to worry about burning the chocolate (which I might otherwise do — eek!). At one point, the chocolate/coconut milk mixture became a little gritty and lumpy, but adding some of the liquid coconut milk from the can fixed that and it became smooth again without a problem. Then I added some Heering brand cherry liquor until I could smell the cherry aroma just a bit on the chocolate, and it was strong but not overwhelming to taste. 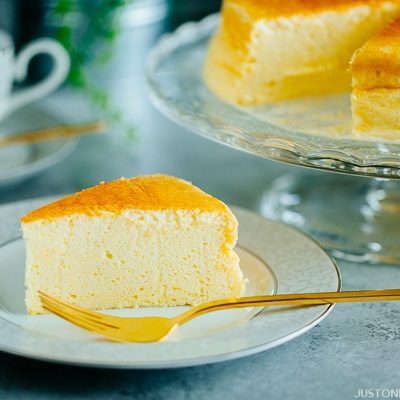 It became a nice smooth, velvet solid consistency in the fridge without any problem. The liquor I added really added an amazing flavor, and a tiny 2cm x 2cm square is extremely satisfying and rich, all on its own! Oleander, you’re very kind and awesome! Thank you very much for sharing! I’ll refer to your comment if anyone asks me for vegan/lactose-free version! It’s great to know that you made these without cream! Thank you for sharing this valuable information with me and my readers! 🙂 I’m so glad you enjoyed this chocolate recipe! Can I use normal whipping cream or thicken cream to replace heavy whipping cream? Can use Hershey chocolate to make this chocolate? Ive never liked using heavy cream in recipes…is there any other cream i can use to combine with chocolates such as semi sweet or bitter? I do this on yes”day, I put at refrigerate for over night, but how come it still soft? May I know what went wrong? Hi Alice! It looks like the chocolate you used has vegetable fat, instead of 100% cocoa butter. When the chocolate is made of good quality, it will not solidify. That could be my first guess. If you used high quality chocolate, then I have to see what else went wrong… so far, people who failed seem to have used the wrong kind of chocolate. Hope this helps! I tried this recipe, but the chocolate was too goey to work with, even after leaving it overnight in the fridge! What did I do wrong?? Hi Ana! Thank you for trying this recipe! Some people who had trouble with this recipe always tell me that their selection of chocolate was not good after we discussed possible cause. 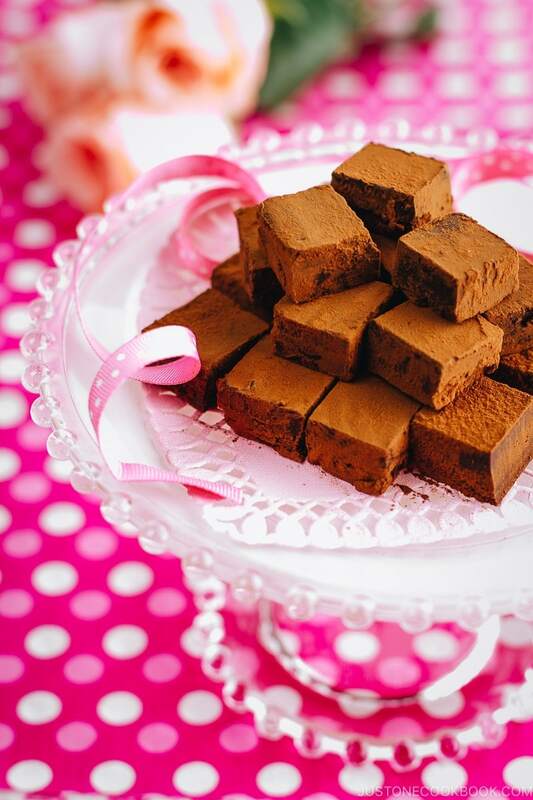 Make sure the chocolate you use was good kind (should contain ONLY cocoa butter, not vegetable fat). Also, make sure your chocolate didn’t seize due to water (please read in my Note section). When you describe “goey” it sounds like your chocolate got seized by either over heating or water got into the chocolate for some reason. Hope this helps. How much liqueur should I add? Hi Ling! You can use 35% fat heavy cream. Many people from Malaysia tried this recipe, so I’m sure it’ll work. 🙂 Hope you enjoy! OMG I really want to try this recipe. Thanks for sharing! I was wondering if you’re able to make a milk chocolate version, and if so, whats the chocolate to cream ratio? Thanks so much! First off, I would like to thank you for sharing this wonderful recipe! I had good luck and no troubles on my first attempt but I tried making it again today and for some reason, when I tried cutting the chocolate into pieces, it kept cracking/breaking. This didn’t happen the first time around so I’m not sure what’s causing this problem. Any suggestions? I’m so excited to try out this recipe! My uncle just brought me some Nama chocolate as a souvenir from his trip to Japan and I instantly fell in love with its smooth, creamy texture. Is there any reason why you didn’t melt the choc first then only combine with the heavy cream which has been warm up? When I used your method by heating up the heavy cream first, the choc was not completely dissolve, it still left some very tidy pieces of unmelted choc and in the end I put it into Thermomix to cook slightly under 100 degree n it turned out quite nicely but don’t think it is as smooth as Royce choc though. Hence would like to understand whether there is any reason why u did u this way. Was wondering whether it will be smoother if we melt the choc first. Btw, I love all your recipe, they r easy n good. Hope to learn more fr u. Thanking u in advance. Hi Pei! 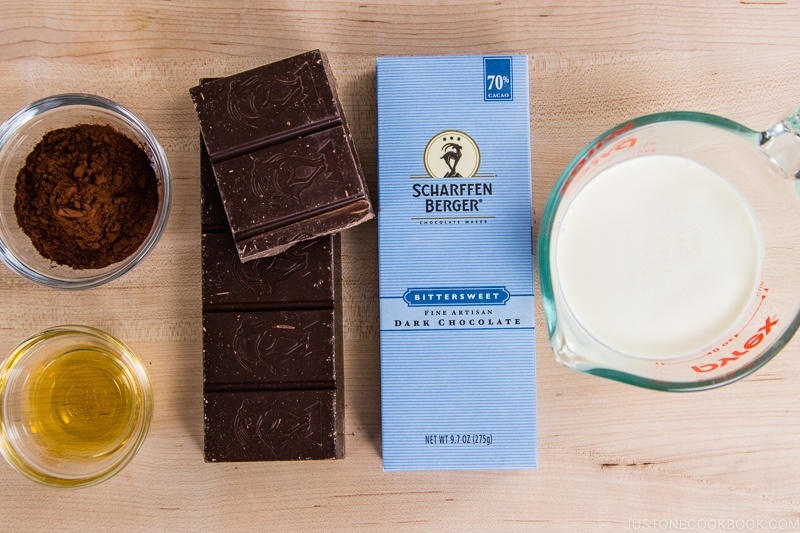 The common method is to heat up cream and pour over shaved (finely chopped) chocolate or put the shaved chocolate into the heavy cream. Save time and save pot/bowl to wash. Did you cut the chocolate finely? It should melt pretty easily. 🙂 I’m so happy to hear you enjoy my recipes. Thank you!! The recipe came together well but if you’re like me and find dark chocolate to be incredibly bitter and almost inedible, make sure you use milk chocolate. I used 60% cacao and winced and made faces at the taste. Hi I came across your recipe and I must say that I am absolutely in love with the simplicity of this. Can I know how much alcohol you put into that amount of chocolate? Does the amount change depending on what alcohol is used? For say rum VS Irish cream VS Moscato. What about tea flavors? 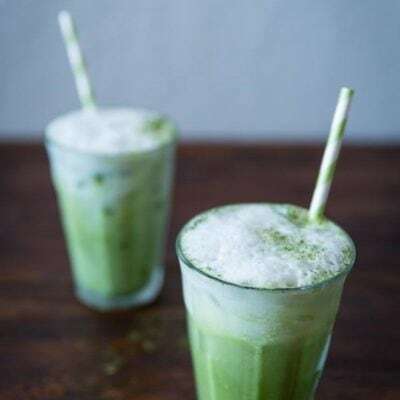 I know that you have a green tea matcha recipe. What about other teas like Darjeeling? I made these today, as I am addicted to Royce! Lol, I usually get the milk chocolate one but this recipe is for dark chocolate which I also love. I used Cadbury chocolate 70% and they turned out delicious! Mine don’t look as good as yours Nami but they taste almost as good as the real thing! Gonna try milk chocolate next time ???????? ariagato! 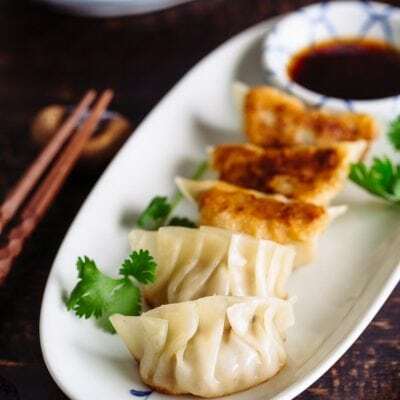 Do you have a recipe for pork soup dumplings? And can you give me an exact recipe for the nama chocolate for an 8×8 pan? Meaning 1 cup of cream to how much chocolate. And how much liquor if I want to add? I LOVE your recipes and have made several. The gudon being my favorite. Thank you! Hi Kim! Xiao Long Bao is very hard and time consuming and I most likely won’t make it…. it’s just one of those things that you need to put your whole energy to it…. Thank you for trying my recipes! 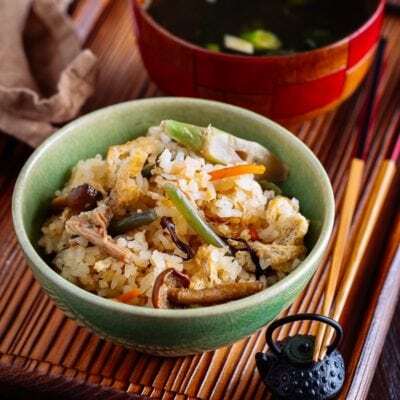 I’m so happy to hear you like gyudon recipe! How much liqueur should I add into a batch of the recipe? Hi Huyen! Whipping cream is different from heavy / double cream. You will need heavy cream for this recipe. I googled and found this link. Hope this helps? Thank you so much for sharing this! I can’t wait to try it. Can you tell me how much liquor to use, I don’t see an amount anywhere. I’m sorry if I missed it. Hi Stacey! Yeah I am pretty positive that it works too – I remember I’ve used it once… 🙂 Let me know how it goes! Perfect! I may try it for Valentine’s day for my husband. <3 Thank you. Hi I’m wondering what kind of high quality chocolate you would recommend using for this recipe. I was thinking Hershey’s or Meiji but I’m not sure if that’s considered high quality.. I love Royce Nama chocolate! So happy to have discovered it in Japan and then found it in Hong Kong and now Vancouver 🙂 Matcha and milk are my favourites. This looks delicious, i must give it a try. how much sugar is needed? I think it might be bitter. Hi Judi! No sugar, just heavy cream and chocolate. If you prefer sweeter taste, use milk chocolate instead of dark chocolate. ???? Thankyou for providing such wonderful recipes. I live in Tasmania so our cooler weather is perfect for your recipes. Keep up the great work and thankyou again for imparting your knowledge. Oh my goodness!! These look like melt in your mouth chocolates. If my husband hadn’t bought me a box of chocolates today, I’d be making these tomorrow. They look mouthwatering. Happy Valentine’s Nami! Wow! This is so cute! The presentation is awesome. I missed the post this year, but next year I will definitely make this. I usually make royal icing cookies for my friends on holidays, but it’s good to mix it up sometimes. I am much inspired and appreciatedo to you for your wonderful skill sharedo with me. Hi Shierly! I am sorry for my late response. The parchment is attached to the chocolate BUT it should come out clean…. Question: how do you clean a fine mesh sieve after using it to strain kanten? Hi Nami, thank you for sharing the recipe. I want to make these for a dinner party, but there’re people that I don’t know well and I’m afraid that not all of them enjoy dark chocolate. Can it be made with half milk and half dark chocolate? Thank you for this lovely recipe. Can I keep the Nama chocolate in the freezer so that it can last longer instead of just 2 or 3 days? Thank you. Hi, I’d like to try your delicious nama chocolate. What is the size of the tin you used, so that the chocolate has the perfect height? I wonder if we keep the chocolate in the fridge for long time, is it still good? how about the maximum time to keep it and can I use any Biological preservative to keep it stay longer? Thanks a lot. Can you keep the refrigerated for more the. 3 days? 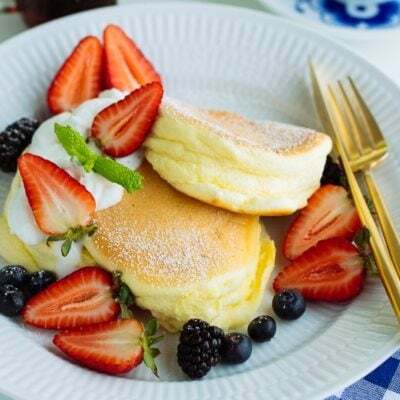 Hello, I want to make your recipe but unfortunately, I can’t find any heavy cream in Jakarta, but the recipe requires 38% heavy cream, I can only find 36%. Is there any substitute I could use? What need to add or substitute if I want to make coffee flavor? Hi Lilly! Coffee flavor… I’ve never tried making it. It looks like it’s best to use instant coffee (not liquid, that’s why). Hi! This looks soooo good! I am going to try your recipe very soon! But before that, I have a question, will the texture be different if i use CHOCOLATE COINS instead of chocolate bar/s? Thank youu!!! Instead of cutting the chocolate block after it has cooled, is it possible to pour the chocolate into ice cube moulds? I just realised this question has been asked before, didn’t know I have to click a button to see comments. Hi Yvonne! Let me know how it goes! Yeah… it’s hard to see the comments. My new web design which will release the end of this month has a question tab, hopefully, it’ll be easier to go through everyone’s questions (and my answers). Thank you for sharing! I recently discovered the Royce chocolates and was thinking to surprise my husband for his bday. This is probably just better idea than buying it from store. Quick question, can I use cocoa nibs instead of chocolate for a slightly bitter taste? Hi Akshata! So happy to hear you got to try Royce and how sweet of you to make it for your husband’s birthday! I don’t think cocoa nibs will melt? How about using bitter chocolate? Hi Nami! I just tried your recipe! It took me a while to cut all the chocolate but I made it! Except I wish I read your recipe notes earlier as mine turned out lumpy and oil separated =( I think the maybe cream was too hot. It’s in the fridge right now, but hopefully it’ll at least taste ok?!!? Hi Jasmine! What type of chocolate did you use? Make sure that it contains cocoa butter because some inferior brands contain vegetable fat and that could cause separation. If you remove the heavy cream before full boil (Step 5) it should not cause the issue. Your heavy cream should be okay. Is it possible your kitchen equipment has water or moisture? Hi Nami! I Used Lindt EXCELLENCE 70% Cacao chocolate bar. It shows cocoa butter on the ingredients — doesnèt look like it contains vegetable fat. It wasn’t at full boil, I had the heat on Medium for a few minutes I think? My equipment was dry I believe as it was just in the cupboard. The taste turned out ok, but it had white spots from the oil after it dried up~ My only assumption is the cream was too hot. I’ll try again in a couple of weeks! Thank you for letting me know Jasmine! Yes, please keep me posted and wishing you good luck on your next batch! I just tried this again. This time right after I pour in the chocolate and start mixing, for the first 5 seconds, a bit of it looks nice and smooth, but it started to get clumpier and thicker as I kept mixing. I see in your video, you mixed for a while but it’s still nice and smooth! Do you know what I could be doing wrong? Is it possible that some of your tools got moisture? It’s so strange… 🙁 I’m sorry you can’t get the right consistency. I am going to add powdered strawberries! I followed the recipe but I can’t seem to get it right? The chocolate doesn’t harden even though it’s been in the fridge for 5 hours, and half a day in the freezer and it’s like nutella or some kind of spread… How do you think should I go about with it? Hi there! Thank you for trying this recipe! With the 2 ingredient recipe, I really need to know what kind of ingredients you used for this recipe. The chocolate should harden even with room temperature if you keep it for 5 hours, but we speed up the process by putting in the fridge. If it does not harden, then something is not right. First, your chocolate didn’t separate, right? Everything looked like mine till you pour and spread the chocolate evenly? Any different texture etc? Quick question, is it possible to avoid the shredding of the chocolate by melting the whole bar and then adding it to the cream? Thank you Moosie! Haha, you’re sweet. 🙂 I think you can do that, but you still need to chop the chocolate into chunks so it melts evenly and faster. So if you have to chop chocolate anyway, I think this method is faster? Is there anyway i can do this without liquor or and alcohol?? This recipe looks so easy and such a beautiful presentation! I’ve had Nama chocolate before and it’s really smooth and rich and I didn’t realize how simple it was to make. 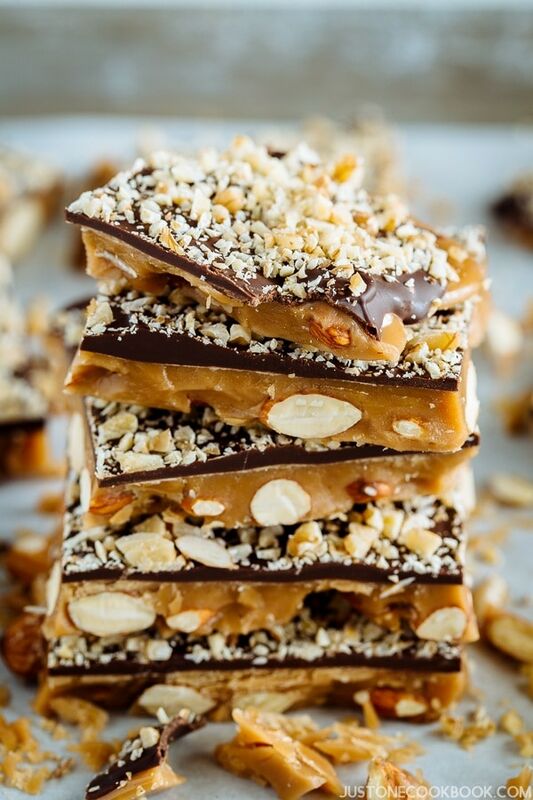 I was wondering if it’s possible to use milk chocolate for this recipe or a mixture of milk chocolate and dark chocolate since I usually prefer a sweeter chocolate? Hi Kelly! Although I have only tried it with semi-sweet, I think you should be able to make it with milk chocolate (according to my research). 🙂 Hope you enjoy! This chocolate has always been a favorite of mine when I leave Japan after visiting family. Thank you for publishing this recipe. I can’t wait to try this! !